Use our instant quote tool to check rates and availability. Once you have found your dates, click Request to Book to begin the reservation process. Total balance includes all fees and taxes. 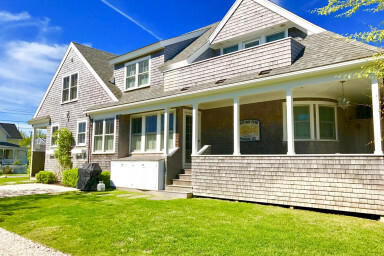 Welcome to SALTAIRE an exquisite vacation home in the premier Brant Point neighborhood of Nantucket. It was recently professionally decorated and the owner tends to every detail, assuring that the home is supremely comfortable and convenient. SALTAIRE is a 5 minute walk to Jetties Beach, Children's Beach, Town, Nantucket's finest restaurants & Brant Point Lighthouse. 4 bedroom, sleeps10 (1 king, 3 queens, and 2 twins) 3 full baths, central AC, outdoor shower, gas grill, a well appointed kitchen that can easily provide for the family, and a large dining room table that seats 8. Other amenities include a dishwasher, washer/dryer, cable TV, Sonos sound system & Wireless Internet, linens, towels, beach chairs all provided as well. This is a non smoking, pet free home.